Hmmm, no posts here recently, but it is because I’ve been pretty busy preparing a “masterclass” on digitisation for the ARK Group as half of a two day workshop earlier this week called “Revolutionising Library Management”. My half was all about digitisation from a library manager’s perspective – not so much the technical side and stuff like colour management, the explanation of vector images and the mechanics of various metadata schemas. 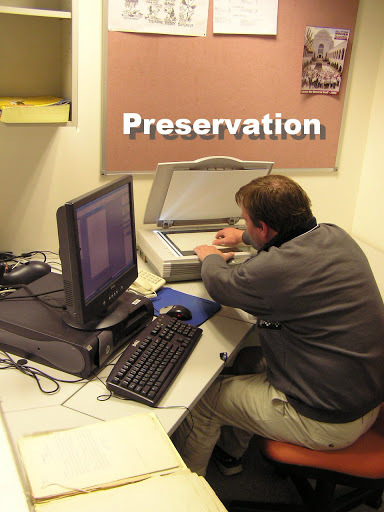 PRESERVATION: There are some who don’t believe or understand the essential link between any digitisation program and preservation. But it is there and it is there in two forms. Firstly because we do digitise as a preservation strategy. In our institution we have preserved documents and images that could only have been saved using digital techniques. Thermal papers meant historic documents were disappearing before our eyes and acetate syndrome was destroying rare photos. There is also an often disregarded preservation benefit in giving access to digital surrogates which prevents or minimises the risk involved in allowing physical access to rare, fragile or unique collection items. Secondly, whatever you create through digitisation programs or projects needs to be preserved: through a curatorial life cycle, just like other collections do, but with different requirements as applicable to digital objects and collections. Learning by PLAYING: Adults learn best by doing (at least in my experience) – sorry, but I think it is true and this is my blog. I’ve also been involved in digitising archival and museum materials for a long time now and I reckon we’ve learned more through our projects than any courses any of us have ever undertaken. So my motto would be “start now and learn by doing”. The chances are the authorities will probably go for hardened criminals like mass murderers before they come after you, so you’ve got a bit of time up your sleeve. MANAGEMENT & PLANNING: A lot of useful material of late about digitisation has been indicating the importance of abiding by sound project management principles and using appropriate planning methodologies in your initiatives. This greatly assists us when the authorities (decision makers and purse holders) come after us or don’t understand what it is we are doing and why we are doing it. COMPROMISE: This comes up continually in our projects and you won’t see it in any of the theories emanating from academia and various standards organisations. The fact is that hardly anyone I know in this field meets all the criteria and principles that are mapped out for them or even mapped out by them. All the practitioners have made compromises somewhere, whether it be in metadata, file formats, digital preservation, QA, storage, evaluation, reports or many other critical elements of digitisation. That’s all for now, but you can check out my del.icio.us bookmarks (see the tags on the right of this post) for some new an other really useful sites on the same subject. Mal, thanks for the mention. It’s okay to not always agree. Not agreeing makes for better conversation! Many a compromise has been born out of healthy disagreement. I hope sometime you’ll leave a message when you find something that you take exception to. It would be interesting for me to hear your perspective. I’m sure I would learn from it.